The Florida State Seminoles have joined the ranks of college football's elite teams much quicker than most anticipated, and the play of freshman quarterback Jameis Winston has plenty to do with that. While Winston is probably FSU's most important player, there is a great deal of talent that has contributed to the Seminoles' hot start. Florida State is heavily favored to beat ACC rival and fellow undefeated opponent Miami (Fla.) on Saturday night, but it won't be able to do so without production throughout the lineup. Leading rusher Devonta Freeman and leading receiver Rashad Greene also figure to play a big role, but it doesn't stop there. Here are three X-factors who will step up for the Seminoles and lead them to a huge win over the Hurricanes on Saturday. Winston doesn't look to his tight ends with a great deal of regularity, but when he does throw the ball to junior Nick O'Leary, something good happens more often than not. O'Leary has developed into a very dangerous weapon for the 'Noles as he has turned just 17 receptions into 307 yards and six touchdowns. According to ESPN's David Hale via ESPN Stats & Info, Winston has completed all but one pass in O'Leary's direction outside the red zone this season. O'Leary is one of the most explosive tight ends in college football as he is averaging better than 18 yards per catch, including a 94-yard reception against Clemson a couple weeks ago. Florida State has so many offensive weapons that it is easy to forget about O'Leary since he isn't necessarily a consistent part of the offense. One defensive lapse opens the door for O'Leary to make a game-changing play, however, which is something Miami can't afford to give up. 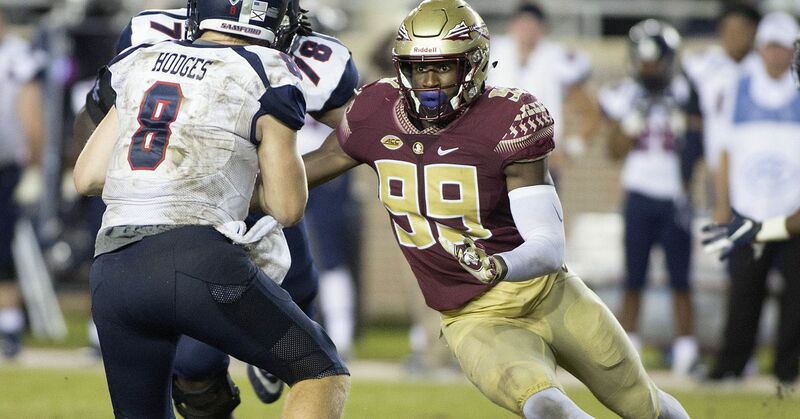 O'Leary has really started to turn some of his raw talent into something more this season, and it is clear that he is developing into a reliable target for Winston. O'Leary isn't the biggest tight end around at 6'3" and 248 pounds, but he can run like a receiver and he has great hands to boot. There should be some mismatches available to him against Miami, and he'll take advantage of them. On a team as stacked as Florida State, it isn't often that the kicker is discussed. With that said, freshman kicker Roberto Aguayo has really opened some eyes this season. The Seminoles have won essentially all of their games in blowout fashion, so he hasn't yet been put in a high-pressure situation, but that could change Saturday. Miami is a sizable underdog, but the Hurricanes are an extremely talented team and they may be able to hang in there against FSU. If that is the case, Aguayo may need to make a big kick at some point. The transition for a kicker from high school to college is an extremely difficult one, especially when playing for a premier program like Florida State, but Aguayo has made it seamlessly. During Florida State's 49-17 demolition of NC State last week, Aguayo tied the school record for most consecutive field goals and extra points made with 54, according to Warchant.com. Aguayo went on to break that record as he has connected on all 58 of his attempts this season. Aguayo is 48-of-48 on extra point attempts and a perfect 10-of-10 on field goals. Aguayo has only attempted two kicks from beyond 40 yards, and he has yet to try a 50-yarder, but that shouldn't take away from the accomplishment. The kicking game is often an adventure in college football unlike in the NFL, so Aguayo is really doing something special. Look for him to be a factor on Saturday. The Seminoles boast an extremely impressive stable of running backs, but a converted safety is turning more heads than any of them. Junior Karlos Williams has settled in as a change-of-pace back for Jimbo Fisher's team, and he has added another dimension to the offense. He is among Florida State's most efficient offensive players as Hale tweeted about his carries-to-touchdowns ratio during last week's beatdown of NC State. Williams racked up more carries without scoring after that tweet, but the fact remains that he does a lot with precious few opportunities. Williams has 349 rushing yards on just 44 carries this season, which means he is averaging a shade under eight yards per carry. He also has seven rushing touchdowns, which leads the team. Freeman is clearly the Seminoles' workhorse as he has 87 totes, but Williams is just as important. Miami won't have a second to breathe Saturday night because Florida State will continue to throw weapon after weapon at the Hurricanes from an offensive perspective. The Florida State running game is pretty much guaranteed to succeed regardless of who is in there because of Winston's presence. Whenever Williams is on the field, Miami will have to be cognizant of it because he is a home run hitter who can change the complexion of the game in a split second.